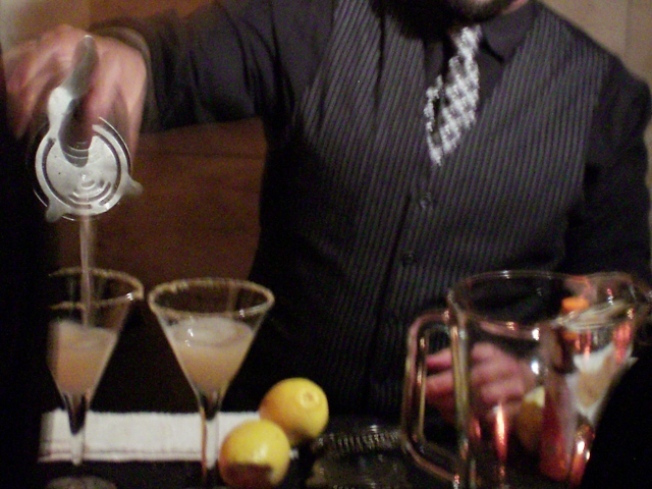 At Brooklyn Eats, sip libations from the Clover Club's mixologists. FULL HOUSE: Stop eating now, ‘cause you’ll need room for the gluttonous onslaught that is the annual Brooklyn Eats event, unfolding tonight at Brooklyn Navy Yard’s Steiner Studios. Thirty-plus restaurants from the lower 718 (Buttermilk Channel, Bussaco) serve up specialties and specially-designed dishes, while some of your favorite purveyors of booze (Clover Club, Sixpoint Craft Ales) help you wash them down. 6-8:30PM. HIGH-CONCEPT: Okay, work with us: Vincent d’Onofrio, the actor from Law & Order, Men In Black and so on, presents a show at Joe’s Pub that pays tribute to an imaginary country singer named George Gerkie, featuring artists like the countrified Laura Cantrell and Joe Vinciguerra. Hey, it can’t be much worse than Garth Brooks’ Chris Gaines experiment. The George Gerkie Cowboy Experience starts at 7PM. GOING ONCE: If you don’t have wagons full of spare change to bid on big-ticket items like an original photograph of Madonna by Herb Ritts or a private party at The Box, you’ll have to console yourself with sights like acrobats twirling overhead and burlesque beauties splashing about in a giant glass bathtub filled with gin. That – and much more – goes down at the 3rd Annual Naughty Auction at the Angel Orensanz Foundation, and every dollar goes to the National AIDS Fund and We Dream the Cure organizations. 7PM.